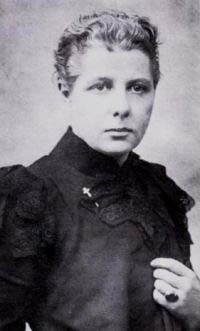 Annie Besant was a prominent Theosophist, women's rights activist, writer, and orator. Annie Besant came into the seance saying she wanted to speak with "John," otherwise known as "Jack." She tells him that he is an old soul who has had many incarnations. She asks whether he was interested in Egyptology when he was younger, and he replies, "Yes." She says the reason is that he was in Egypt in another incarnation, involved in the religion of that day. In Egypt, she continues, he had an inner awareness of things of the spirit, and struck out from the traditional religion into a different direction. She believes he was sent back in this incarnation for a purpose. He has a deep realization of things of the spirit. She says he has the ability to show the gifts of the spirit, but hasn't done very much about it. She says he could do the work and give a great deal of help and enlightenment, but he will have to make some changes. She mentions that he has been a "creationist," but doesn't follow through with why that is significant. She says that "they" want him to exert himself to do this work. When she was on Earth, she was interested in things of the spirit. She had the realization within herself of the truths. She asked whether the sitters know about the Theosophical Society and explains that she was one of the early people to be involved in it. She says that Spiritualism is fundamentally true, but there is a tendency for some to not understand or know. "One incarnation is like one jewel in a string of jewels, a necklace of jewels." You must not assume that in one incarnation you will understand completely or know where you are heading. People may not come back for centuries of earthly time. Others choose to return to do specific work, to illuminate the era in which they find themselves by their philosophy, teaching, and realization of themselves. She says that all in the circle have work to do. It may not always be apparent or achieved, and there may be obstacles put in front of them. But she cautions that they should not be unduly concerned if temporarily they can't achieve certain things. Everyone is searching for truth, for what is the real you. The real you will not be the period in which you find yourself. Each person in the circle has been brought there together to share knowledge, to share experience, and to share the great realization of self. Human nature being what it is affected by material things, you can't always do what you wish to do, but each one in the circle has come together for a purpose. She said to them that they had learned a great deal, more than they knew. They had learned things within themselves, that they may not be able to speak about or demonstrate, but all there, together had become part of each other. She said they had a "group soul." She continued, "Individually, you have your individual spirits, individual ways of expression, but nevertheless, there is a group soul." This soul is vitally important as a whole. Sri Baba (Sri Satya Sai Baba), she says, is a great soul, a very old soul, with many incarnations. She assures the sitters that they are brought into that group. Those on the other side are trying to break down barriers brought about by religion: intolerance, hatred, and malice. Many evils are brought about by religious teaching, but the foundation of all religions is the same truth. The circle with Leslie Flint, she said, had a wider realization, a wider understanding, and in their own ways, were opening up their own awareness to transmit it to others. One life, she says, is a drop in the ocean of time itself. She said they were blessed because they had seen the realities of the spirit and had been strengthened by the love of the spirit. The many souls around them were happy to be with them, and many a soul uplifted them. "With the knowledge and realization you have, you are endeavoring to do the things that truly are of the spirit to bring enlightenment, joy, and comfort." If there are setbacks, try to realize that there is a reason. Life is as it is. She cautioned the circle that they were living in a material world with many stresses, bad relations, and sometimes health problems. She encourages them to know that the love around them is powerful and strong and loving thoughts around them come from the minds of innumerable people. All the great teachers and all the great souls realized that as the goal is nearer and nearer, there are all kinds of problems. They became weary too, and yet the truth became proclaimed, and it is still around in the Earth world. She assured them that they cannot fail because love overcomes all things and encompasses all things. "Go into the world of the flesh and proclaim the truth. Think only of that which is truly of the spirit, that it will strengthen you for further activity. We love you and are very close to you, closer than you could ever comprehend." She said that innumerable souls, not two or three were around them. People speak of one or two guides, but there were innumerable souls helping them. She spoke of Mickey, Leslie Flint's control, who was killed at age 11 and when he comes into the seance speaks with a boyish, high-pitched cockney accent. However, she adds, he is no longer of the earth. He is a great soul, a brilliant soul of the spirit who enters into the Earth plane condition temporarily and takes on the old persona of the 11-year-old boy that he was when he was on the earth. When Mickey comes, he assumes the material self. He comes deliberately to make the atmosphere less tense. With a group of people such as their circle, the human element is natural in the early stages of inquiry into the truth of survival; people want proof and evidence. Then, those on the other side do their best to provide that proof, so it has to be on the material levels--otherwise, it would not be acceptable. However, when a circle gets past that and is on a mental and spiritual level, then those on the other side can discard temporarily the self, which to some extent the sitters expect. Those coming from the other side can talk on different levels. She says how remarkable it is that she and the others coming to speak can temporarily become the person they were while on the Earth plane. It's most remarkable because they have had many material bodies, and know many perspectives on truth at many levels. She says that they were very fortunate that they had come into contact with various mediums. She says that we are all instruments, and some are much further advanced than we are aware of. We might not call ourselves mediums, but we sense, feel, and understand things beyond "intuition." It isn't intuition. It's understanding or realizing something that might be or could be. "All life is mental," she says. "We are all thinking; we are subject to thought." That is why it behooves people aware of this truth to think on a mental and spiritual level that will change us individually so we can do the work that we have to do. We on the Earth plane, she says, must overcome the restrictions of the material, but we have the truth, and will fight for that truth, expound it, and become that truth. "We're all part of the same group," she assures them.